Step 1 Place the veal in a large heavy-bottomed pot and add cold water to cover by 2 inches. Bring just to a boil. Immediately drain in a colander and rinse well with cold water. Step 2 Wipe the pot clean and return the veal to it. Add the wine and bring to a boil. Add the stock, bring it to a boil, then reduce the heat to a simmer. Add the leek, onion and carrot. Tie the parsley, thyme, celery and bay leaf together with kitchen twine and add to the pot along with a big pinch of salt and a little pepper. Cover the pan and simmer until the meat is very tender; check after 1 hour but it will take closer to 1 1/2 hours. Step 3Remove the meat from the pan with a slotted spoon and place in a warm bowl. Cover and keep warm. Discard the cooking vegetables. Increase the heat and boil the cooking liquid until it is reduced by a little more than half. Step 4Meanwhile, melt 3 tablespoons of the butter in a small skillet and whisk in the flour. Cook, stirring, until the mixture is smooth and bubbly. Whisk in the cooking liquid and cook 10 minutes, until the stock is thickened somewhat. Remove from the heat. Step 5Melt 2 tablespoons butter in a large skillet over medium heat and add the mushrooms, 1 tablespoon of the lemon juice and a sprinkling of salt. Cook, stirring constantly, for 2 minutes. Remove from the heat, cover and set aside. Step 6Cut an X in the bottom of each pearl onion. Combine in a saucepan with the sugar, the remaining 2 tablespoons butter and 2 tablespoons water. Cook over medium heat, stirring constantly, until the onions are just tender and glazed, about 5 minutes. Step 7Return the veal to the pan with the sauce. Add the mushrooms and their liquid, mixing well. Place over low heat and stir in the creme fraiche. Heat until warmed through. Taste and adjust the seasoning with salt and pepper and more of the lemon juice, if needed. Serve the blanquette with the onions arranged on each portion, garnished with the chives. In Recipes-list.com we have selected the most viewed recipes from category - Main courses . Enjoy the best recipes specially selected for you! 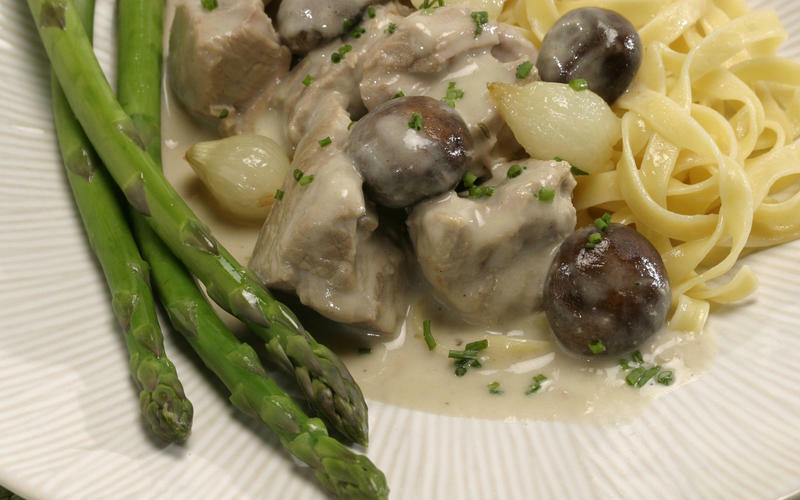 Blanquette de veau is the right choice that will satisfy all your claims.